ID Keys: (Breeding plumage): Gray head and neck with rusty patch on front of neck, thin dark bill slightly upturned at tip. 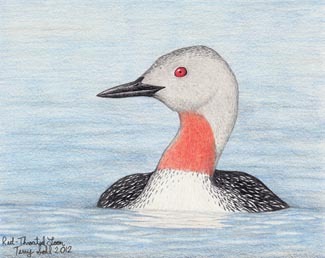 The Red-throated Loon is the smallest of the loons. It breeds further north than any other loon, reaching the northern edge of Greenland. While they are regular migrants to the Great Lakes, they are only rarely seen elsewhere on the interior of the continent. In South Dakota, they are very rare visitors. 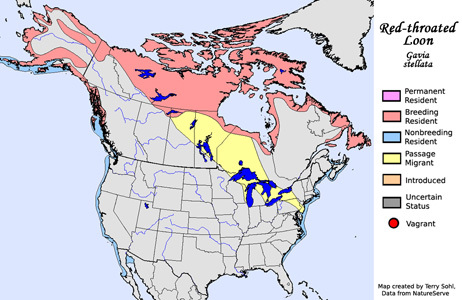 Habitat: Breeds on ponds and lakes in extreme northern North America. In winter, found primarily on the ocean. Diet: Mostly fish. Also crustaceans, mollusks, aquatic insects, frogs and tadpoles, and leeches. Behavior: Unlike other loons, they are able to take off from water much more easily, often not even requiring a running start. They also can take off directly from land, something other loons cannot do. They feed by diving from the surface and swimming underwater in search of fish and other prey. Unlike other loons, they do not carry their young on their back. Nesting: Red-throated Loons are thought to mate for life. Pairs usually return to the same site year after year, defending it against all intruders. The nest is usually a mound of vegetative material, built by both parents. The female usually lays 2 eggs, with both parents helping to incubate them. Upon hatching, the young leave the nest within 24 hours. Both parents tend to the young and help feed them. Song: Generally silent during migration and in winter, but has a long wailing aaa-OOOOH-aaa on summer breeding grounds. Migration: Summers in northern Canada and Alaska. Winters along North American coastlines. Conservation Status: Numbers appear to be stable or in a slight decline, but Red-throated Loon populations are still strong, and they are found over a wide geographic area. The IUCN lists the Red-throated Loon as a species of "Least Concern". South Dakota Status: Extremely rare visitor, with only a handful of records in the state. Large numbers do appear on the Great Lakes in migration, but they are only rarely found elsewhere inland.